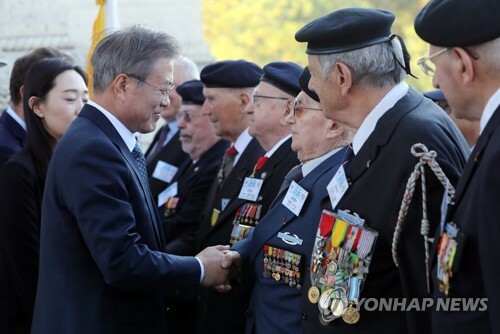 PARIS, Oct. 15 (Yonhap) — South Korean President Moon Jae-in on Monday stressed the need to ease international sanctions against North Korea when and if the communist state takes practical steps to denuclearize. The call came in a bilateral summit with French President Emmanuel Macron where the South Korean leader asked France, a permanent member of the U.N. Security Council, to spearhead the move when conditions are met. 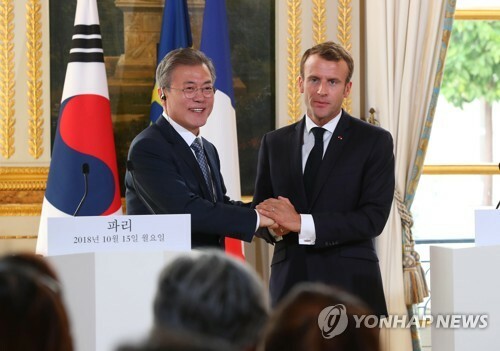 “We must further encourage North Korea’s denuclearization process by easing U.N. sanctions when and if we decide the North’s denuclearization process has at least reached a point of no return, and I ask President Macron to play such a role as (the head of state of) a permanent member of the U.N. Security Council,” Moon was quoted as saying. “We are ready to fulfill every mission given to us as a permanent member of the U.N. Security Council to realize complete, verifiable and irreversible denuclearization of North Korea,” he said. He is currently on a five-nation tour that will later take him to Belgium for the Asia-Europe Meeting (ASEM) summit that will involve the heads of state or government from 50 other countries.